I slowly push open the heavy door and get slammed with the smells and sounds of grinding coffee beans. It’s 6 in the evening and not too busy- only about five adults are sitting at the dark wooden tables quietly talking and reading. I get in line and gaze at the packaged coffee in woven baskets and displayed coffee tumblers. Finally it’s my turn. The barista is a college-student, and she looks unsurprised. “With whipped cream?” She starts marking the foam coffee cup with Sharpie. After paying, I wait a few minutes for my small drink, and smile when I see my name correctly spelled on it. I grab a straw and sit near the tall windows with open wooden blinds. I take off the lid and scoop up some of the delicate whipped cream, then smell the coffee. Nothing. I take a tentative sip. It’s a hot, smoky, and spicy taste. Then comes the strong espresso. It’s not very sweet at all. “Can I take a sip?” My mom didn’t order anything. I hand it to her. And so goes my first encounter with the Starbuck’s Pumpkin Spice Latte⎯ the drink that started it all. Starbucks, the American coffee company, first launched the latte in 2003 after the success of their winter seasonal drinks. Since then more than 200 million lattes have been sold, generating $80 million in annual revenue. It’s not just the drink that’s gained popularity, but ALL things labeled pumpkin spice have had increased sales of 79% since 2011, according to the Nielson Company. These items include chocolate chips, Oreos, oatmeal, Pringles, gum, sausages, M&Ms, bagels, cereal, yogurt, dog food… as well as lattes. Starbucks isn’t the only coffee shop noticing the trend. Panera, Dunkin Donuts, and McDonalds’s have all offered their own version of the addicting beverage (for far less than $4.45 a Grande) to lure in customers craving that autumnal nostalgia. Meanwhile sales of fresh pumpkins are decreasing, even with Starbucks adding “real pumpkin” to their drink this year. One might be wondering⎯ why is Pumpkin Spice the supreme flavor of fall? “When your Instagram feed is filled with friends wielding their first Pumpkin Spice Lattes of the season, or when everyone in your 2 pm coffee break group decides to go for a PSL, you’re probably more likely to get one, too,” reported Psychology Today in early September. It goes hand-in-hand with social conformity, where we match our activities with the social “norm” to feel secure. Couple this with free mug cozies, and you’ll get a nationwide pandemic. Starbucks has created the Orange Sleeve Society, a slightly exclusive club where loyal PSL members are mailed an orange coffee cozy with “Team PSL” knitted across. The worshipped drink even has its own Twitter account. The fact that the flavor is limited edition also plays a significant part in the popularity. Starbuck’s PSLs are only seasonal, and Peppermint Mochas and Eggnog Lattes will soon steal the spotlight. The psychological term to explain this successful marketing tool is the “reactance theory.” When our behavioral freedom is limited or reduced, we’re more motivated to regain them. We’re even more anxious to taste that artificial goodness as it evokes good fall memories. Darker mornings and naked trees will get replaced with cozy evenings of warm drinks and fleece blankets. Nostalgia has been shown to improve mood and bring comfort in the loneliest of times, as well. Finally, there’s all that sugar. Since prehistoric times we’ve been strongly drawn to foods packed with sugar and carbohydrates as they provided the most energy. 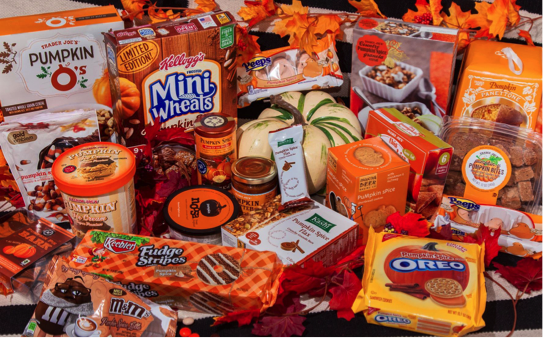 So next time you munch on those Pumpkin Spice Pringles, blame it on nature (or Social Media).